The brethren of Anfield Lodge No 2215 which meets at the Geoffrey Hirst Masonic Suite at Woolton Golf Club, were very pleased to have as their principal guest the Assistant Provincial Grand Master Kevin Poynton. 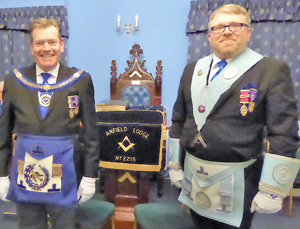 This was an unusual meeting, in that a double second degree was to be worked, with one of the candidates being Andy Fleming from Football Lodge No 9921, of the Province of Hampshire and the Isle of Wight. There was also great support from the South of England, with the WM of Lodge of Harmony No 156 from Plymouth and accompanying them, a delegation from Lodge of Fortitude 105 from the Province of Devonshire. 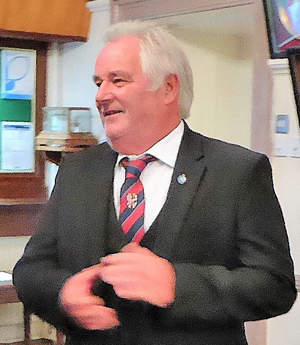 The WM of Anfield Lodge Alan Ledger welcomed everyone, opened the lodge and quickly dispatched the regular business. The DC Gary Devlin announced that Sean Whelan of Football Lodge, had in January been elected a joining member and asked if he could be admitted. Sean was congratulated by the WM and welcomed into the lodge. The DC retired from the lodge and returned to announce that the APrGM Kevin Poynton was outside and demanded admission. 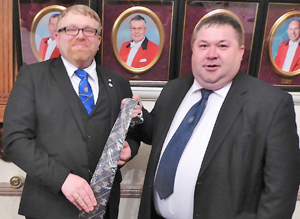 Kevin, accompanied by grand lodge officers Fred Hunter, Barry Elman and Woolton Group Chairman Andrew Whittle, with acting Provincial grand officers, entered the lodge to the tune of Z cars, where Kevin was welcomed by the WM and then offered the gavel of the lodge. Kevin, keen to enjoy the evening quickly returned it! Alan asked if there was any brother present desirous of being passed to the second degree and the two candidates rose to their feet. The senior deacon Steve Lyons and junior deacon Mike Tattersall, accompanied the candidates, whilst they answered the usual questions before being entrusted. The two candidates retired from the lodge to be prepared by the tyler Brian Jones and the lodge was opened to the second degree. After the proper reports on the door and due questions, the candidates were admitted and the ceremony of passing continued with great dignity. After the senior warden Eric Carroll had explained the working tools of the second degree, the WM congratulated both candidates. They retired to restore themselves to their former comforts and on their return Sean Whelan of Football Lodge delivered an exemplary presentation of the tracing board. The lodge was closed to the first degree and the charities were honoured. Alan rose to enquire if there were any communications from Grand Lodge and the secretary reported receipt of the recent Grand Lodge communication. 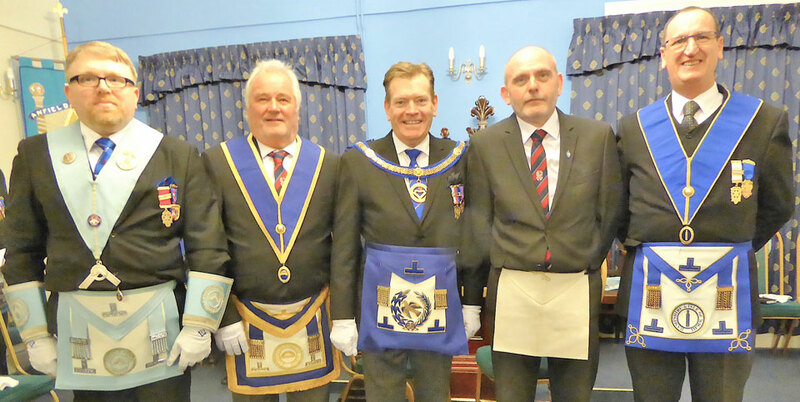 At this point Kevin rose to say that he had been very pleased to be present to witness a fine ceremony and congratulated both the officers who had participated in the ceremony and the three brethren on becoming members of Anfield Lodge. Special mention was also made of the presentation of the tracing board by Sean Whelan. Kevin also wished to thank the acting officers who had, throughout the year, accompanied him on visits and thanked Dave Dutton for all he had done. The lodge was closed in due form, so that everyone could make their way to the bar for pre-dinner drinks and socialise with the many guests who had travelled such a long way. The festive board was excellent, with a first course of spring rolls followed by chef’s curry and a sweet of peach melba. A raffle was held which raised the sum of £153. In response to the toast to his health, Kevin thanked the grand officers and acting officers for attending and once again Sean Whelan was thanked for his outstanding presentation of the tracing board. Steve Lyon proposed the toast to the guests, saying that it was an immense pleasure to have so many people present, especially as many had travelled from the far end of the country and he coupled the name of Robert Govier, brother-in-law of candidate Andy Fleming, to the toast. Robert responded in jocular fashion, saying it had been an excellent ceremony and a great evening and congratulated the WM on a fine ceremony and the two deacons for their part.The WM of Lodge of Harmony Martin Leave, also responded in jocular fashion saying that Freemasonry is one big family and we are all part of it, before going on to present one of their ties to Alan Ledger, who reciprocated in like manner. Martin is a season ticket hold at Liverpool Football Club, so visits to Anfield are inevitable! Just prior to the last toast, Andy Whittle informed everyone that it was hoped that the lodge would conduct a double third degree in January, which would be eagerly looked forward to. A superb night came to a close with the final toast given by the tyler Brian Jones.